Publish2 already makes it super easy for journalists to save links to any content on the web using our “link tool” (AKA bookmarklet). Just click “Link with Publish2″ in your browser when you’re reading an article on a news site, and in a few seconds it’s saved to Publish2. But what about when you’re not reading news on a news site? What if you do your daily reading in a feed reader like Google Reader? What a hassle to have to open the feed item in the browser in order to save it to Publish2. 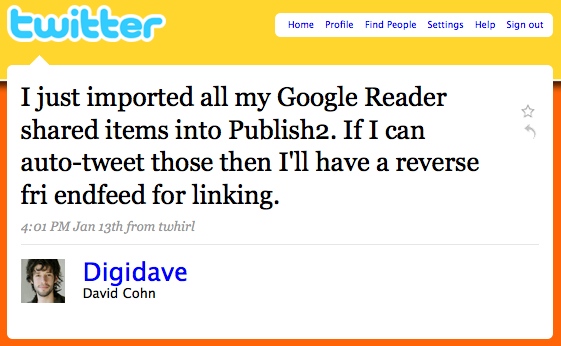 You can now import Shared Items on Google Reader as links on Publish2! 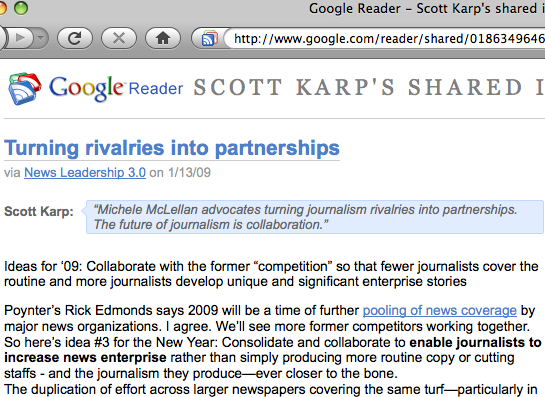 If you use the Share with Note feature in Google Reader, your note is imported as a comment on Publish2. You can automatically send Shared Items to a Publish2 Newsgroup, which can be used for collaborating with other journalists and/or publishing the links to your site. You can share your imported links with other journalists on the Publish2 Newswire or save them to My Research to use for your reporting. 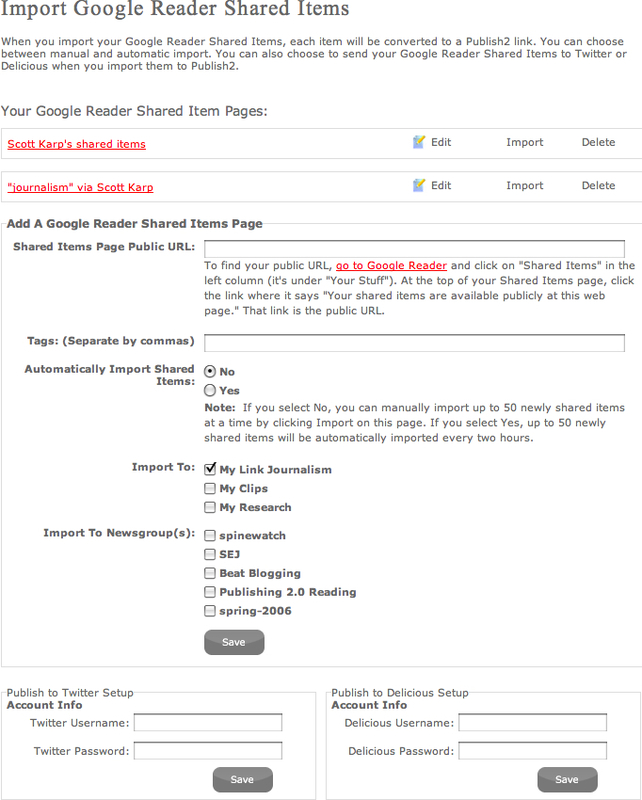 You can add tags to imported links automatically — great if you set up a Shared Items page based on a tag in Google Reader. You can also send links to your My Research page, or subscribe to your own feed and save your best work to My Clips. 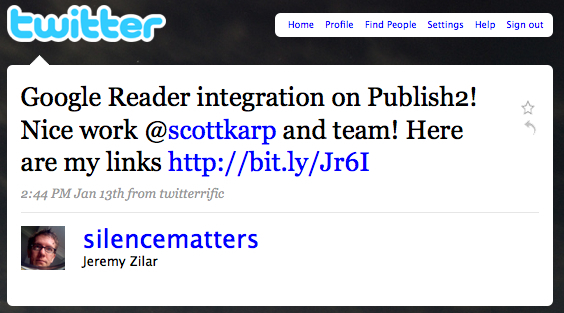 You can automatically send Google Reader Shared Items to Twitter and Delicious! It’s easy to set up. You can set up links to be imported automatically, or you can manually import links after you’ve caught up on your feed reading. Then click on “See your shared items page in a new window.” The URL in the window that pops up is what you put in Publish2 to get it set up. Now you can practice link journalism directly from your feed reader. Google Reader is just our first foray into feed reader support. We’re planning to connect to Netvibes, Netnewswire, and any others that are in popular demand (let me know if you have any requests).